There's no time like the holidays to engage your loved ones on this important issue. Holiday meals are a great time to start the climate conversation with your loved ones. Most people who know me are too polite to question climate change when I’m around, but there are relatives and old family friends who hint at the great divide between their worldviews and mine. I think they sincerely believe that I would crush the economy forever if I had my way. On the other end of the spectrum are friends and family who are alarmed by climate and genuinely want to know what we and our elected officials can do about it. But no matter who’s in the mix, it’s hard to bring my work home for the holidays. Most of the time it feels easier to leave our existential crisis unmentioned. Since the election, the public debate around climate change has only become more toxically politicized, which makes it even more appealing to remain silent—another boon for Exxon and the fossil fuels industry. At the very least, it can feel pointless to try to argue with anyone who isn’t fully convinced about climate change by now. But at the interpersonal level, I still believe that hearts and minds can change at a dinner table and that those individual changes matter collectively. Consider the transformative shift in opinion—and law—on marriage equality in this country. That shift is inconceivable without the courage of people who came out to their friends and families. The climate fight is different in fundamental ways, but progress similarly depends on a transformative shift in opinion and law. Right now, only one in five Americans hear people they know talk about climate change at least once a month, which says to me that we aren’t talking to our friends and families enough. It has grown easier to make the case that climate change matters after a year of unprecedented hurricanes and wildfires. For people who are unconvinced about the role of climate change in these events, it’s worth mentioning that scientists are now able to determine with a very high degree of certainty how much more likely these disasters become with rising temperatures. For instance, a recent study found that the total area burned in the western U.S. over the past 33 years was double the size it would have been without any anthropogenic warming. That additional area equaled the area of Massachusetts and Connecticut combined. If you want to push back on any argument that there are always anomalies in the weather, here is an especially powerful graphic that shows the undeniable increase in temperatures over the last century, with escalating increases since the 1980s. 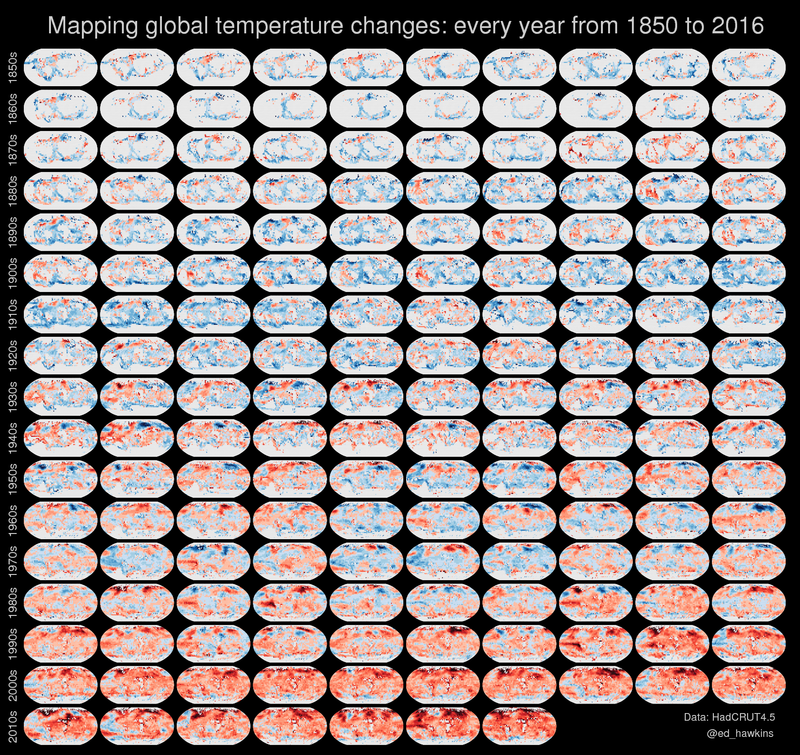 These maps depict global temperature change for the past 166 years. Maybe more important than the science or data, which has left many people unmoved, is the willingness to share your personal experience of climate change. For example, climate change knocked at my door in the middle of the night last month. I was home alone with my 5-year-old son. There was so much smoke, it got in through closed windows and woke us up. A fire was raging in the Napa Valley, and for the next five days, there was no view out our windows, just gray. All the kids at school were wearing masks. Everyone felt sick from the bad air, and everyone knew someone who had been evacuated. We were addicted to news of the fire, which were uncontainable for days because it was too hot and dry for the time of year. There was nothing to do but hope for a merciful change in the weather, which didn’t come until after 43 people had died and 8,400 structures had burned. When we talk about the way climate change is getting real, it’s hard to have a superficial, partisan debate. Why is all of this such good news? Clean energy is a boon to the economy no matter what your views on climate are. Right now, China is positioning itself to dominate the new energy economy, while the U.S. is doubling down on the fossil economy of the past. But there is still time for the U.S. to lead, if we make clean energy a top-line, bipartisan issue in this country. For those who feel too defeated by the scale of climate change to engage, it’s worth underscoring that we are witnessing an energy revolution that can secure the future if we force progress fast enough. Burning fossil fuels accounts for roughly three-quarters of U.S. greenhouse gas emissions, along with much of the worst air and water pollution in this country. Transitioning from fossil fuels to clean energy is the most important thing we can do to limit climate change. Clean energy also happens to be a powerful engine for health, wealth and democracy given the outsize contribution of fossil fuel interests to our money-in-politics problem. The Trump administration and the fossil fuels industry is actively working against clean energy progress, but we have the tools, the courts, and the people power to keep advancing clean power in states and cities. If you want to talk about how we keep making progress over the next three years, a few concrete examples are written up here and here and here. The way that people are showing up, around the country, to transform our energy system is a source of hope and cheer for me and my colleagues at Earthjustice. Help us spread the word! Previous Blog PostFlorida Towns Started Banning Styrofoam. Then Industry Crumpled the Movement.